For a Baroque-inspired look with utmost regality, choose the Mens Short Renaissance Cloak. This stunning cloak is made from elegantly patterned brocade fabric in beautiful silver colors with white faux fur trim on its collar and bottom hem. The shorter length of this cloak is modeled after authentic historic styles and allows for easier, lighter wear and increased mobility when compared to a full length cloak. Satin lining adds an extra touch of elegance to this remarkable Renaissance cloak, and the cloak is worn draped over the shoulders and secured by a chain across the chest. Great for historic reenactments, medieval-themed events, and Renaissance festivals, the Mens Short Renaissance Cloak is perfect for achieving the refined look of historic nobility. 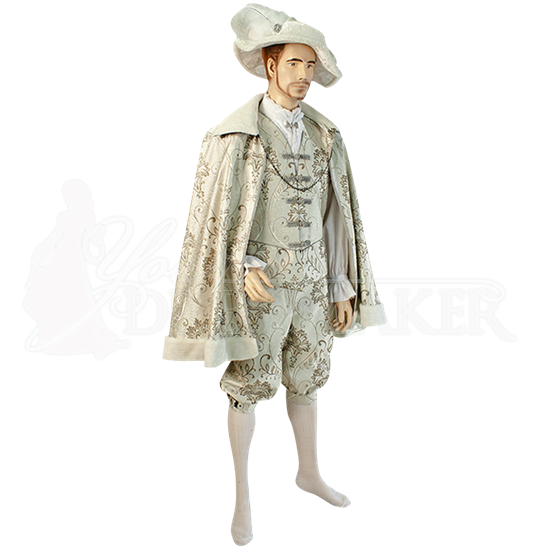 For a matching Renaissance look, combine this brocade cloak with items like the Mens Renaissance Doublet (MCI-402) and Mens Renaissance Pants (MCI-389), not included.